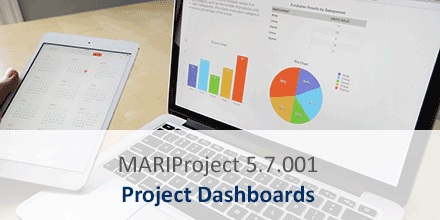 MARIProject version 5.7.001 comes with a new project dashboard functionality that allows to compile various key figures and analyses for a project. Similar to the cockpit in SAP Business One, project-related key figures and analyses are represented graphically. As key figures, you could select for example degree of completion or unpaid invoices. Possible analyses would be recorded hours per employee or a comparison of recorded and planned hours. Furthermore, a specific period such as “January to December 2018“ as well as the chart type (e.g. bar chart or line chart) can be selected in the project dashboard.